If you have never been to the Dam Ducky Derby in Evergreen you are missing a great time. 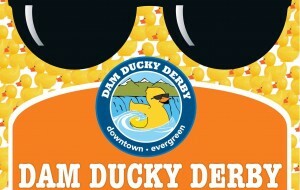 Not only does the Ducky Derby support a great cause, it’s a lot of fun! It is a great place to mingle with your Evergreen Neighbors. The kids love it! Watching thousands of of little yellow ducks cruise down the creek is a riot. This year is (2014) will be the 5th annual Dam Ducky Derby. It is usually held in August. The way it works is you purchase Dam Ducky Derby Numbers at any Downtown Evergreen Shop and then you show up to the Derby and root your duck on and hope they win. The prizes aren’t chump change either. Last year the prizes were $3,000, $1500 and $500. I remember watching my kids just crazy watching the ducks fall from the net that was raised up by the Evergreen Fire Dept and seeing nothing but yellow. They were cheering for their ducks. I didn’t have the heart to tell them we didn’t even know which duck was theirs since there were thousands and the numbers were written on the ducks bottom. It was still great and I am sure it was a time my will never forget, all the Dam Ducky Derbies they will attend in their lives. I will update this post when I find out out what the exact date is for the 2014 Dam Ducky Derby is. I hope to see you there this year. It is a great Evergreen Community event!